Tax percentages are the amount of income taxed and due to the tax authority of one's country. In the United States, tax percentages vary from individual to individual and business to business. Furthermore, some organizations are tax-exempt and some income is not taxable. Consequently, calculating tax percentages is not always the same, but tools and rules do exist to make figuring out what percentage of tax is due easier. This article will illustrate and discuss various ways to figure out tax percentages and provide examples. Section I will discuss the calculation of tax percentages for individuals whereas section II will outline the same for business taxation. Last, the article will provide tax percentage calculation tips to help locate and determine tax percentages and provide ways to more accurately determine tax percentages. The basic method for determining taxable personal income in the United States is to use Federal tax rate tables. These tables illustrate how much tax may be due on different levels of income in the form of a percentage. It is important to note however, that the information in the tax tables does not necessarily apply to all tax situations. For example, self employed individuals are taxed in a way that does not allow them to claim the normal standard deduction when computing taxable gross income. To illustrate the tax schedule, all one need do is locate a tax table and identify one's income level, and filing status. For example, if one is married filing jointly, the Schedule Y-1 is used. Moreover, if the household income for both married partners filing jointly is over $15,650 but under $63,700, one's taxable income would be 10% of the taxable income up to $7,825 plus 15% of the taxable income above that amount. For example, if the couples taxable income is $50,000.00, only $42,175.00 of that amount would be taxable at 15%, making the tax $7,108.00 It is important to note tax tables can change from year to year so it is important to verify the current values in the calculation. When filing state tax, figuring out what is due involves consulting State issued instructional material and the State and local sales tax tables of the IRS form 1040 instructions. The latter of these sources provides base percentage income tax levels at the state level with various exemptions. For exact numerical and/or dollar amount due, actually completing the state tax forms can be helpful. 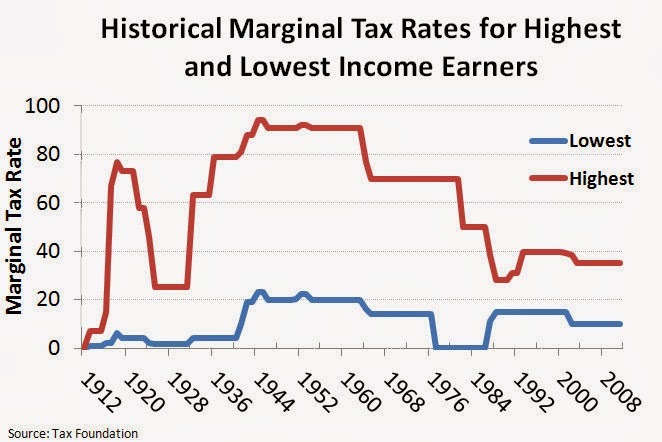 As the chart below indicates, federal income tax brackets change. This means saving in a tax deferred retirement instrument such as a 401(K) or traditional IRA might not pay off if tax brackets rise in retirement years. Business taxation can be different from individual income tax, however some cases, business tax is assumed by the owners. Examples of this would be taxation of such as sole-proprietorships, and S-Corporations. In such cases the business income is passed through to those individuals. In the case of corporations where pass through income is not possible, different tax rates apply to higher levels of corporate income. For example, the highest level of tax corporations may pay is 39% whereas the lowest may be 15%. To determine what percentage is due, corporate income tax rate tables can be consulted after completing the necessary tax forms. In both the cases of individual and business tax, completing tax filing forms with deductions, credits and supplemental forms is essential in accurately calculating taxable income. The lower this value, the less income will be taxable. After determining the taxable income, up to date tax tables provide an easy way to figure out tax percentages and dollar amount due to the tax authority. When determining tax percentages it can be helpful to keep in mind some methods and practices that may end up allowing a tax filer to accurately identify taxable income and hence avoid overpaying taxes. The following tips illustrate an overall method of approach to taxes that may prove helpful in effectively calculating taxable income. Figuring out tax percentages can be simple of complicated depending on one's individual financial circumstances. This is so as basic tax percentages apply only after taxable income is determined. For this reason, the determining of taxable income is essential in accurately figuring out tax percentage. Once taxable income and filing status are found, referring to IRS and State tax tables can locate the appropriate tax percentage. Figuring out tax percentages is fairly simple, however figuring out how to achieve the best tax percentages possible for an individual, household and/or business can take preparation, know how and diligence in regard to completing tax forms, and understanding tax rules. This article has provided basic information on determining tax percentages. Since basic tax percentages don't apply in all tax situations, it is also important to define what taxable percentage applies to one's tax circumstance.